A little scene I worked on last night and today, which I plan to mail to a good friend in Europe. I added some hatching with a fountain pen after I was done with the dip pen and wash... the fountain pen work turned out a little too bright for my liking, a darker ink would have helped. I love paint boxes... ever since I was old enough to have my first Crayola paint set (and then a Crayola "Caddy" once a year for several years, thereafter), I have never ceased to take delight in opening a paint box and seeing those little jewels of colour laid out within. Earlier this year, when I took up watercolour painting again, I dug out my various paint boxes and set about preparing a field / sketch / plein air kit. 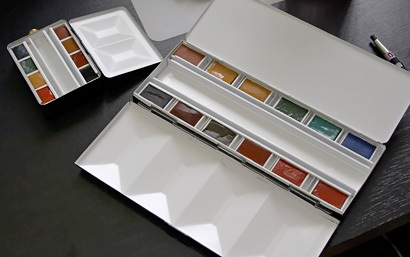 Most of the artist's quality paint manufacturers make a vast array of travel and field paint boxes or paint sets, suitable for every occasion. 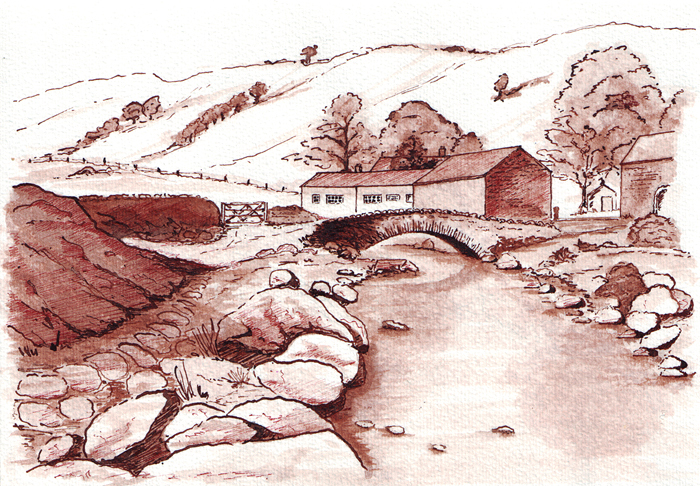 I own several, of which Winsor & Newton are likely the best-known brand. I like metal paint boxes, and so I have recently been looking at buying an empty box with the idea of filling it with full or half-pans myself, but nothing had caught my eye - until I found some wonderful metal paint boxes on the Natural Pigments website! Natural Pigments formulate artist's watercolour and oil paint using rare, traditional pigments, which make for a more subdued, classical palette (you won't find Quinacridone Magenta here). 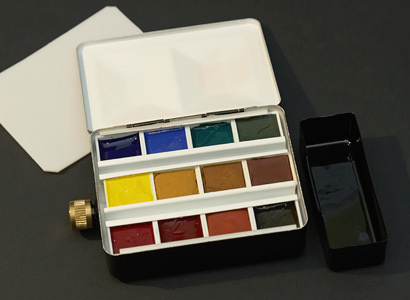 The Natural Pigments paint brand is Rublev, and I was excited to see Rublev Watercolors pre-packaged in heavy duty enamel paint boxes - here was a perfect opportunity to get the metal paint boxes I wanted, and also experiment with a different type of watercolour paint in a classical palette. A beautiful and natural palette comprised of 12 full-pans, this large paint box has a flip-out mixing area as well as four mixing wells in the lid. I replaced an earth red, plus the blue ochre and black for paints with broader mixing capabilities, as well as adding a couple of essentials. 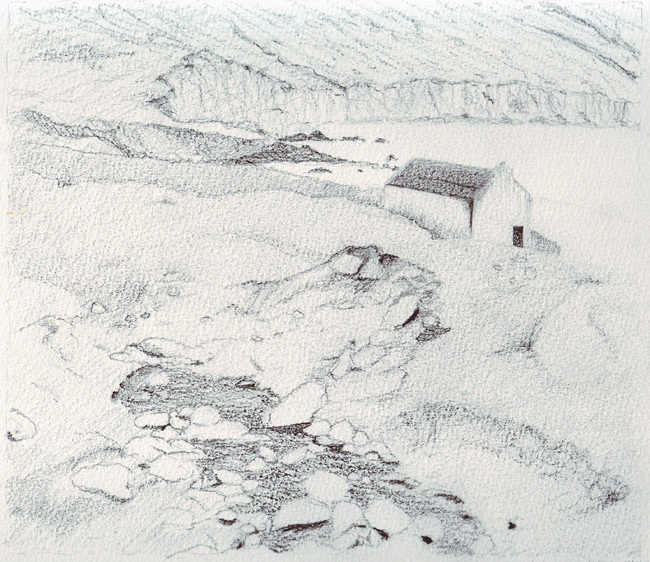 A half-finished drawing from class this week. We focused on creating a tonally-correct value drawing from which we will paint from next week. To buy in Australia, visit The Art Shop website. This great store in Victoria carries the entire range of M. Graham professional artist products.